You can get to Warmbad by car via the A 72 or A 4, exit Chemnitz-Süd or Chemnitz-Nord. If you are coming from Chemnitz, take the B 174 in the direction Marienberg. If you are coming from Dresden or Freiberg, you can reach Warmbad via the B 101. From the Heinzebank junction (B 174, B 101) please follow the signs for “Kurzentrum Warmbad”. There are 180 guest parking spaces available and an additional 70 spaces in the multi-storey car park. The Silber-Therme Warmbad can be reached with the following bus routes: Coming from the Dresden or Annaberg direction, use route T-400. Coming from Chemnitz, use the routes T-206, T-216, T-217, T-489 or T-499. 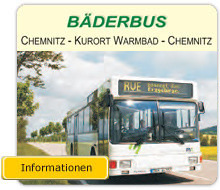 All these bus routes going to Warmbad take you directly to the entrance of the Silber-Therme.